At BC Basement Systems, we specialize in the unique problems that below-grade spaces present. Our installations include a written, transferable warranty that will provide you with long-lasting peace of mind. To schedule a free, no-obligation basement waterproofing quote with one of our specialists, contact us by phone or e-mail today! 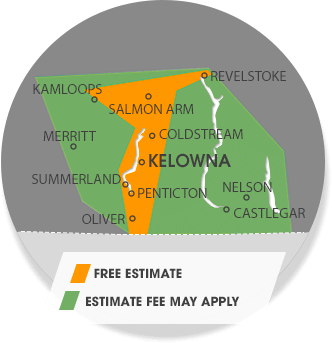 Our British Columbia service area includes Vernon, Kamloops, Kelowna, Nelson, Quesnel, Penticton, West Kelowna, Salmon Arm, Castlegar, Williams Lake, Westbank, Trail, Coldstream, Oyama, Armstrong, Chase, Winfield and many surrounding areas nearby. Contact us for a Free Estimate in basement flooding prevention in Kelowna, Kamloops, Vernon, Nelson, Quesnel, Penticton, West Kelowna, Salmon Arm, Castlegar, Williams Lake, Trail, Coldstream, Winfield, Westbank, Armstrong, Chase, Oyama and the surrounding British Columbia area.